Neither Ben Stokes nor Alex Hales will miss any further England matches as a result of their part in a fight outside a Bristol nightclub in September 2017. Both men faced England and Wales Cricket Board charges over that incident and social media posts, but the subsequent bans were adjudged to be either suspended or already served. All-rounder Stokes, who in August was cleared of affray, has been fined a total of £30,000 and batsman Hales £17,500, £10,000 of which is suspended for 12 months from now. Hales did not face criminal charges. Their case was ruled on by the Cricket Disciplinary Commission, which is independent from the ECB. 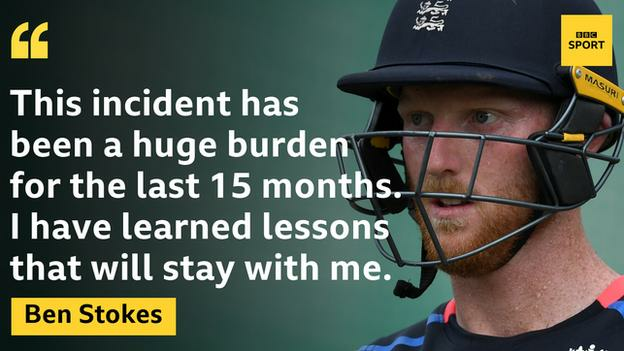 As well as the incident in Bristol, Stokes answered a charge in relation to an “inappropriate video” on social media, while Hales was charged in relation to “inappropriate images”. Both men pleaded guilty to all charges. It was decided Stokes should be banned for eight matches, all of which have been served, with Hales suspended for six white-ball matches, two of which have been served and the remaining four are suspended. It means both men are available for selection immediately, with the squads for England’s tour of the West Indies in the new year due to be announced on Monday. Hales must also undertake what is described as “appropriate training” at his own cost. The CDC said it “took into account the complex circumstances surrounding these events including the considerable legal expenses already incurred by both players”. The incident took place outside a nightclub in the early hours of the morning following England’s one-day international victory against West Indies. Subsequently, Stokes, 27, missed five months of England games, including the Ashes, while Hales, who is not part of the Test side, effectively missed two one-day internationals. 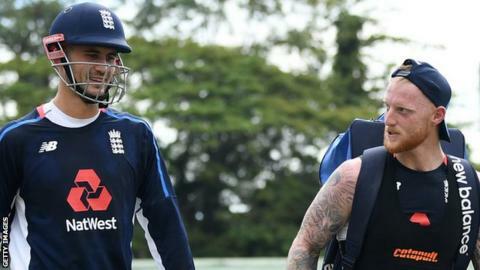 Hales played limited-overs cricket for England in January, while Stokes, who was made unavailable for the tour of Australia, returned for England’s trip to New Zealand that followed. Both men have been consistently involved in the England team since, though Stokes did miss the second Test against India while he stood trial. The Durham all-rounder was stripped of his role as vice-captain of the Test side but, since the conclusion of the legal proceedings against him, has reaffirmed his role as one of England’s most important players, including playing a key role in their 3-0 series win in Sri Lanka. In a statement released after the verdict was announced, Stokes said he had “learned lessons”. He added: “The criminal charges and, subsequently, the disciplinary charges have made it difficult to make public comment about the issues. I have already apologised to my team-mates, coaches and support staff for the consequences of my actions in Bristol. From a cricketing perspective, it can be argued Hales has suffered more greatly than Stokes. The 29-year-old was a fixture opening the batting for England’s one-day side until the incident. In missing the final two matches of that series, Hales allowed Jason Roy and Jonny Bairstow to forge a successful partnership at the top of the order and has since had to contend with filling in when either has been unavailable, or plugging gaps that have arisen lower down the batting line-up. A statement from Hales read: “I am relieved today’s decision by the CDC means this chapter is now closed and I can move on with my career. “There is no doubt I fell below the high standards expected of an international sportsman and that was the reason for my decision to admit the charges and accept the punishment handed down. ECB chief executive Tom Harrison said: “We accept the decisions made by the CDC and the sanctions they have given to Alex Hales and Ben Stokes. “Each pleaded guilty, admitted their charges and has accepted their sanctions. They will now be available to play for England, with the same support as all of our players.